Has European economic and market integration curtailed the autonomy of national industrial relations actors and institutions? Or has it reinforced their roles in securing much-needed economic adjustment? This important book offers a deeply-informed comparative perspective on these questions, drawing on empirical research on changing conditions within and beyond the EU. The book builds on papers presented at the 8th European Regional Congress of the International Industrial Relations Association, held in the UK in September 2007. The authors are leading academic authorities from Austria, Belgium, Canada, Denmark, Germany, The Netherlands, Norway, Spain, and the United Kingdom. • possible rebirth of vocational training systems and apprenticeships. Offering in-depth comparative insights into the way in which national and international systems of employment relations are evolving rapidly in the face of cross-cutting pressures for change, this book illuminates a vastly complex state of affairs. 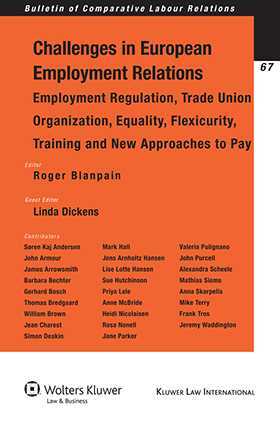 In practical terms, its many insights into how current trends affect specific working conditions open the way to new initiatives in developing and maintaining a just and equitable employment relations regime for Europe and beyond. 1. Challenges of European Employment Relations; L. Dickens. 2. Labour Law and Economic Development: Calibrating and Comparing Regulatory Regimes; J. Armour, S. Deakin, P. Lele, M. Siems. 3. UK Trade Unions and the Information and Consultation of Employees Regulations; M. Hall, S. Hutchinson, J. Parker, J. Purcell, M. Terry. 4. The Role of European Works Councils in the Internationalization of the Labour Movement; V. Pulignano. 5. Flexicurity and HRM for Older Workers in the Netherlands, Denmark, Germany and Belgium; T. Bredgaard, F. Tros. 6. Strong Trade Unions Meet EEC Workers: Locating, Monitoring and Organizing EEC Workers in the Danish Construction Sector; S.K. Andersen, J.A. Hansen. 7. Gender: A Relevant Element of Management Culture? Equal Opportunities between Diversity Management, Regulation and ‘Good Will’; A. Scheele. 8. Union Mergers and Gender Democracy; A. McBride, J. Waddington. 9. Leadership for Change: Making Gender Equality in the Newly Merged Danish Union 3F; L.L. Hansen. 10. How Far Can a Minimum Wage Compensate for the Decline in Collective Bargaining? The Challenges Facing Germany and Britain; A. Skarpelis, W. Brown. 11. The Management of Variable Pay in Banking: Forms and Rationale in Four European Countries; J. Arrowsmith, H. Nicolaisen, B. Bechter, R. Nonell. 12. Vocational Training and its Links with Education and the Labour Market in Five Countries; G. Bosch, J. Charest.